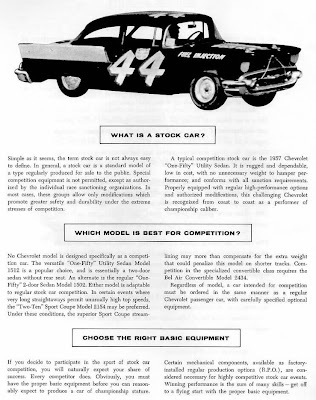 We are now starting to get to the 'meat and potatoes' here where the definition of a stock car is clearly stated followed by choosing the proper model for stock car competition - the 150 models (the 1512 or 1502) unless you were on a speedway then the 210 models would do (2154) for aerodynamic purposes and then there is the convertible class (2434) - and finally we are introduced to the most important section: "Choosing the Right Equipment". We will start getting into the R.P.O. 's (Regular Production Options) next time in Part 5.